The last few days have been downright exhausting, rushing from event to event, few hours of sleep, which inevitably lead to nights of red wine and turning to dinners prepared by two old time favorites, Cafe Rio, and In-N-Out (Did you know they sell 'Veggie's?! A completely delicious vegan option, grilled onion, lettuce, pickle, tomato!). We've been enjoying turning to each other in this energy fueled, distressing time, and celebrating our love for each other, and the beautiful lives we've created for ourselves. That being said, I'm refueled. Today, I was ready to get back in the kitchen. This recipe is so dang simple, I usually have a tupperware in the fridge, ready to bust these little chickpea patties of goodness out in minutes, throughout the week. We usually enjoy them in a massive greek salad with olives, feta, tomato and a super simple dressing of thyme, oregano, extra virgin oil, and balsamic vinegar. My spice dabba holds all of my indian spices. Today I only used the cumin and coriander. Blend the parsley and red onion in a food processor. Add to mashed chickpeas. Whisk an egg with the coriander/cumin mixture, baking powder, a pinch of salt and pepper, and chilli powder. Add to the chickpea mixture. 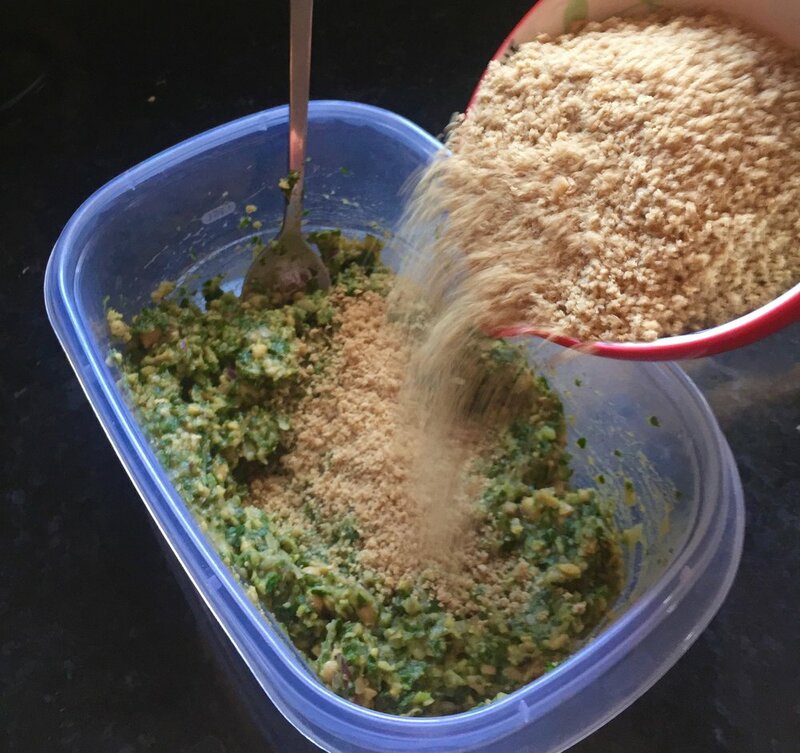 Add the breadcrumbs to tighten up the mixture until it firms up and you can pinch the mixture without it being too wet to stay. Since I don't deep-fry the falafel, I like forming them into palm sized patties. Lightly fry in a nonstick skillet with a few tablespoons of olive oil. I've tried using less oil, but get way less browning and texture. Assemble your favorite salad and devour. Immediately! Mash chickpeas in a mortar and pestle or with a fork. Blend parsley and red onion in a food processor. Add to the chickpeas. Dry toast the cumin and coriander. Whisk the egg and add the baking powder, cumin, coriander, chilli powder, and a pinch of salt and pepper. Add to the chickpea mixture. Add the breadcrumbs slowly, testing the texture, until it's still enough to form into patties. Form small patties and lightly fry in a nonstick skillet with a few tablespoons of evoo set at medium heat. Flip when the edges of the falafel are brown and crispy, about 4 minutes. When they're done, add to a bountiful salad or wrap.